Then our art nights are for YOU! Your inner artist is just waiting to come out! Its’ a guaranteed RELAXING and FUN night out! Just bring yourself, your friends, and let the art night to begin! We offer private art parties, art classes for kids and adults in the comfort of your home. Please call us to schedule your private party. 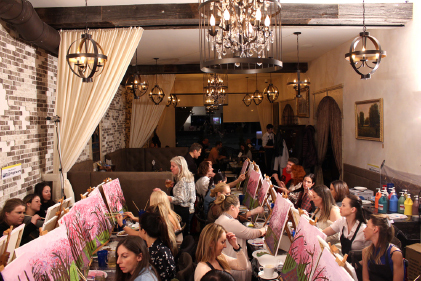 Professional Artist, Garo will guide you step by step in painting, through a 2.5 hours event. Garo will provide everything you need to paint your canvas or wine glasses. Take home your artwork. $55 - Advance, $65 - At the Door. Includes: art instruction, and art materials. One glass of wine and appetizers will be served. To register for Art Night please make a payment using the PayPal form below. To make a payment, please fill out the form by selecting Number of Student(s) Attending, Identify Day(s) of Attendance, Name(s) and Email(s) of Student(s) Attending, then click the "Pay Now" button to process your registration. Reservations: Prepaid registration and a verbal or written commitment specifying dates are required to reserve a space in the art night. Cancellation: Cancellations must be called in 48 hours prior to scheduled class to receive credit. If less or no notice is given and the reserved space is not filled, fees will be forfeited. We are flexible and willing to work with you, and with any schedule conflicts you may have for your private parties. Please feel free to call or email with any questions you may have!